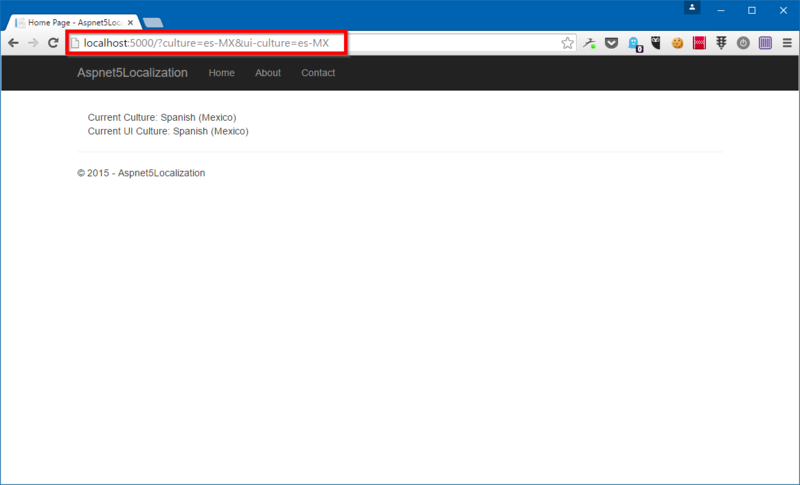 In ASP.NET 5, the Localization middleware can be used to ensure the correct culture settings are applied when serving a request. 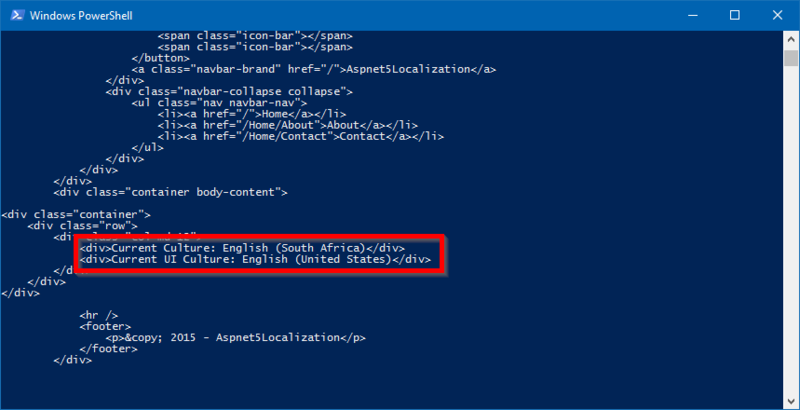 In this blog post I will walk you through the process which the Localization middleware takes to determine the correct culture settings to use when serving a request. I am using Beta 8, and have created a simple web application using the ASP.NET 5 Yeoman generator. The first thing you will need to do is to enable the Localization middleware inside your application. For that you can head over to the Configure method in the Startup.cs file and add a call to the UseRequestLocalization() method. var requestCulture = _options.DefaultRequestCulture ?? The middleware first determines the default (or fallback) culture if all other methods fail. By default this is the culture settings of the current thread, but you can override that by specifying a default culture in the RequestLocalizationOptions which you can optionally pass to the UseRequestLocalization() method (we will look at how to do this shortly). For more information on how the culture info for a thread gets determined, you can refer to the “How a Thread’s Culture Is Determined” section in the MSDN documentation for the CultureInfo.CurrentCulture property. Then the middleware goes through the list of Request Culture Providers (which can also be overridden in the RequestLocalizationOptions), and see whether any of them can determine the culture. If any of them can, then it uses that as the culture. If none of them can, then if uses the default culture which it determined at the beginning of the method. Now you may wonder what the possible Request Culture Providers are. For that we can head to the source code for the RequestLocalizationOptions class, and in the construcutor we can see the possble providers being specified. 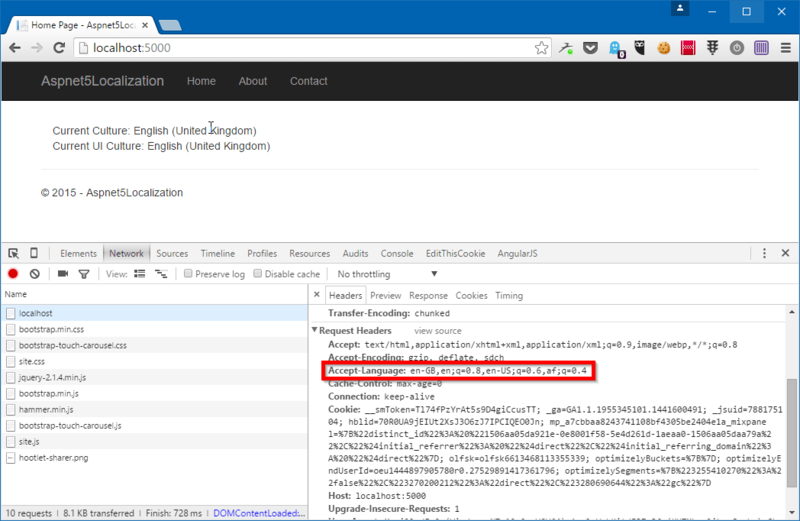 So the query string always takes the highest priority, then the cookie, then the Accept-Language header, etc.. This would not be a complete blog post if I stopped right there. We need to look at how you can use each of these in your application, and for that I am going to start with the lowest priority one, namely the thread culture, and work my way up to show you the effect of each. So lets look at each of those methods in more detail. 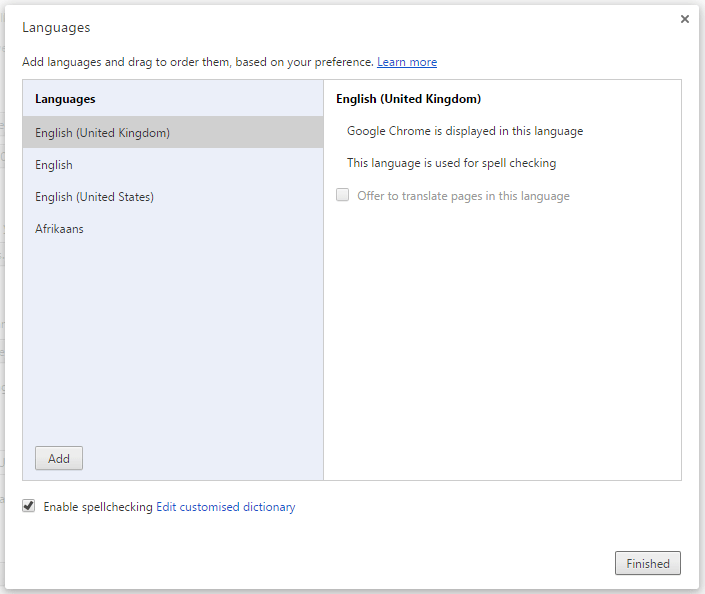 As you can see the culture is set to “English (South Africa)” and the UI Culture is set to “English (United States)”. This is based on my user’s culture settings in Windows. 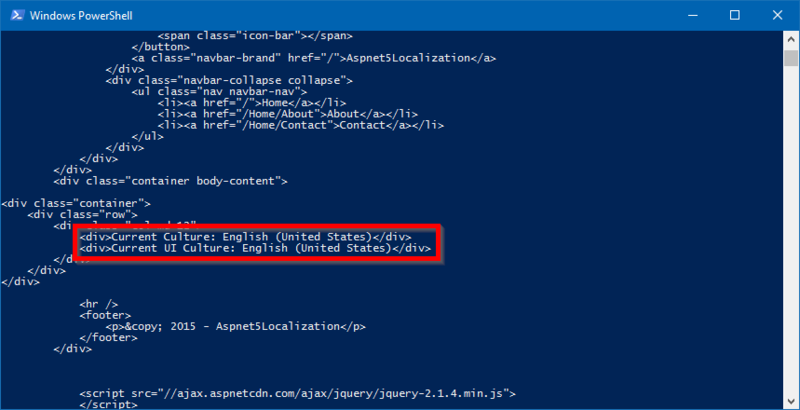 Now doing the PowerShell CURL magic, we can see that both the Culture and UI Culture is set to “English (United States)”. Note that it is important that you set both the culture and the UI culture. You can set them to different cultures but you must set a value for both, otherwise the culture will not be overridden. This is currently the case in Beta 8, though that may change in the future. 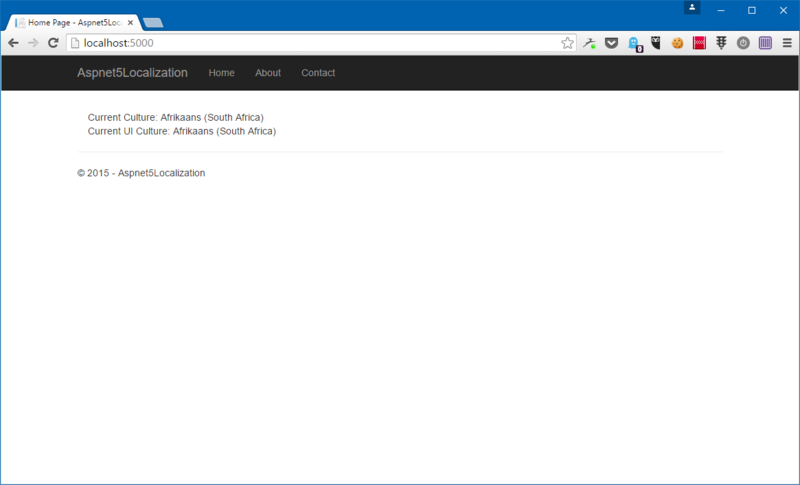 And when I refresh the page you can see that both the culture and UI culture is set to “Afrikaans (South Africa)”. It is strange to me because this behaviour is different from the Cookie provider which requires you to set both values. Maybe this is intentional, maybe it is not, but I find the inconsistency confusing. I have logged an issue on GitHub regarding this, so hopefully they make it consistent across both these providers. 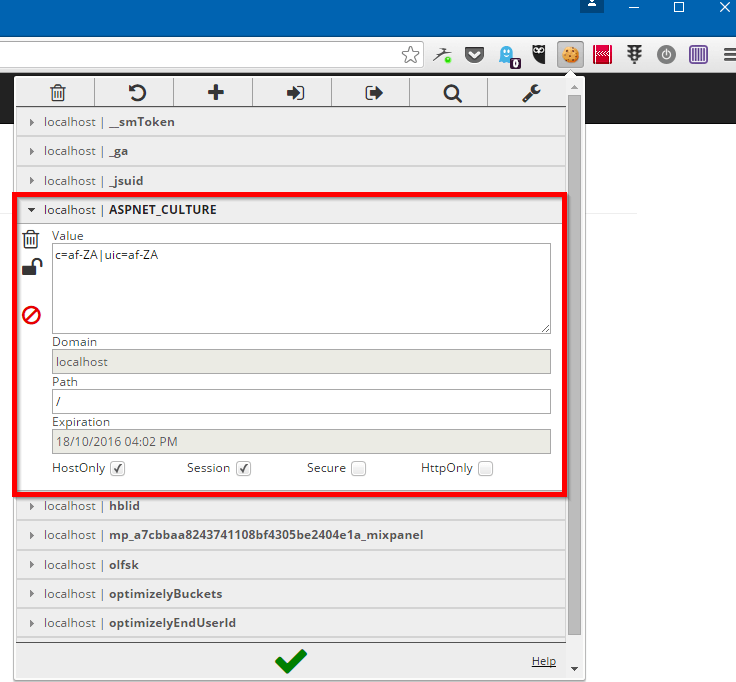 In this blog post I showed you how the Localization middleware in ASP.NET 5 determines the correct Culture for a request. The 3 built-in providers are the Accept-Language Header provider, the Cookie provider and the Query String provider. The model is completely extensible so you can write your own provider to set the culture. Maybe your users can specify the culture in their profile, so you can write a provider to set it based on the user’s profile. You are also free to swap around the order of the providers, so that the Cookie provider for example always takes highest priority. You can even remove some of the providers altogether. It’s up to you how you want to handle this. What I demonstrated is the default behaviour.